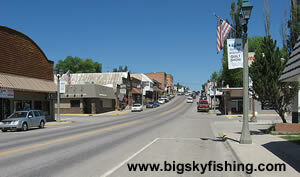 Founded in the 1880’s and located in the heart of Montana timber country, Eureka is a clean and nice small town. The downtown area of Eureka, particularly during the summer, is a busy place and lacking the deserted storefronts that plague so many small towns in the USA today. Of course, Eureka’s location on US Highway 93 and its proximity to Canada plays a big part in this, as the highway brings a steady flow of visitors passing through town on their way into/out of Canada. Despite this, Eureka has managed to avoid the fate of other small towns. Tourism and services to travelers has come to play a bigger role in the town’s economy. And it’s location in a beautiful valley doesn’t hurt, either. Eureka is located in what’s known as the Tobacco Valley, which is part of the Rocky Mountain Trench. The valley is flanked to the east by the towering mountains of the Whitefish Range, with smaller and heavily forested mountains located to the west. Eureka has an excellent location for outdoor pursuits. Lake Koocanusa is located nearby, as are many other smaller lakes that have excellent trout fishing. The hunting in the area can be excellent for deer. Camping is abundant on all the National Forest lands that literally surround the town. Plus, the Lake Koocanusa Scenic Byway begins just outside of town, too. Overall, visitors to Eureka won’t be disappointed. While the town is small, it has plenty for visitors to do during the summer months. And for those heading out into the mountains to do some camping, hiking, fishing or camping, Eureka is an ideal spot to load up on any needed supplies.